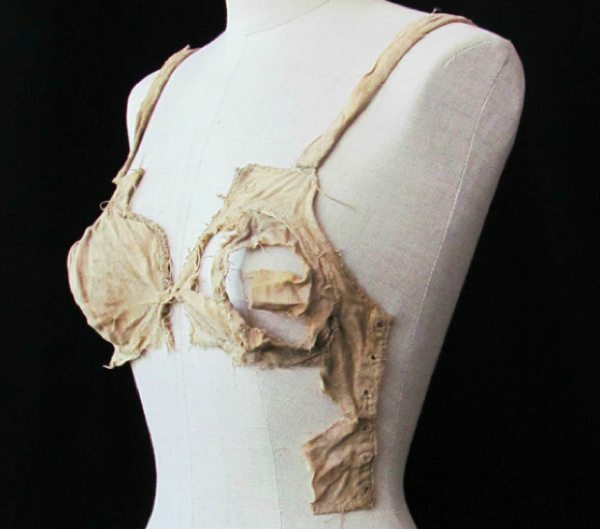 Although it has been some time ago (2008) that medieval underwear has been discovered underneath the floor of the Castle of Lengberg in Austria, it is only now that the internet is completely going mad over them. One newspaper article is even worse than the other, but lucky for us, BBC History published an article, written by Beatrix Nutz herself, the archaeologist doing the analysis of the textiles and on the information available on the website of the university of Innsbrück. For more extensive background information on these finds, please click the links above. Back in 2005 I first saw this little figure when visiting the Münster zum Heiligen Kreuz in Schwäbisch Gmünd while being on vacation in Southern Germany. I was never able to really place this shirt costume historically, as it didn't seem to fit in with what I knew at that point at all. Although there are clear differences between the Tiroler bras and this shift with an empire waist (avant-la-lettre), they probably had the same function: to give support to the breasts. From what is known at this point there is no reason to suspect that the Austrian brassieres at some point had a skirt attached to them. However, in the example from Schwäbisch Gmünd we can suspect that the upper part of the dress must have been fitted and very tight, as was the brassiere in the first image, since we can see no pleats around the waist. Only the skirt has been pleated at the top as it was attached to the fitted upper part. Das Braunschweiger Skizzenbuch, Herzog Anton Ulrich-Museum, Kupferstichkabinett, Braunschweig. c. 1380-1420. One afternoon of combing out the internet yielded quite a few more examples of sleeveless shirts with a high waist. Most examples seem to stem from the Southern-German and Austrian region. One example is almost exactly the same as the one from Schwäbisch Gmünd. It comes from Bohemia and can be found in an artist's sketchbook dated 1380-1420. The only visible difference can be found in the shoulder straps. In the Bohemian example they are clearly separate straps sewn onto the upper part, and not an integral part of the pattern. The birth of John the Baptist, Giusto de Menabuoi, Baptistryto the Duomo, Padua, 1376-7. Slightly different is a sleeveless shirt depicted on the frescos in the Baptistry of the Cathedral in Padua, Italy. Here we can see pleats on the upper part of the dress as well. Possibly this dress is an unfitted shirt that is worn with a belt right under the breasts, or perhaps pulled tight with a drawstring? However, it seems to me that this solution also gives more support than a simple shirt. As we go into the 15th century, the bodice of the shirts more and more starts to resemble the shape of the Tiroler brassiere. This is in line with the changes of fashion. In the course of the fifteenth century the waist becomes more accentuated. This can be seen in the construction of the upper clothes as well, that often have a horizontal seam around the waist. 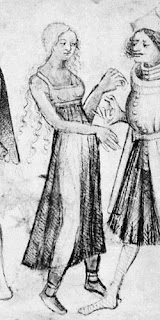 In the 14th century the panels of the upper dresses of women consisted of one piece lengthwise. 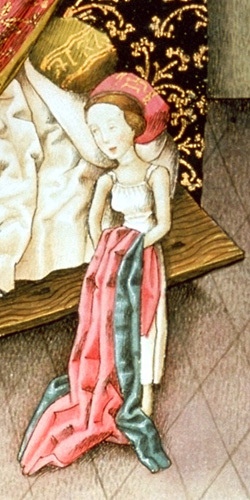 To me, there are a lot of advantages of wearing fitted underwear under your 14th century dress (I have no experience of wearing 15th century dress, but I guess it will be pretty much the same). In order to give sufficient support to the breasts when not wearing fitted underwear, the upper dress has to be very very tight. Firstly, this makes the tailoring process of a dress much more labour intensive and quite uncomfortable too. Second, you also always need a person to help you fit it. Thirdly, the tighter the upper dress is, it will also be more tight around the waist and your tummy. This result is inevitable when you want to avoid any strange "blobs" in your pattern at waist level. Also, with a very tight dress it is really really difficult to attach the sleeves in such a manner that you still have 100% freedom of movement. Another problem is that as soon as you lose weight, your breast support will be gone. As soon as you gain a little waist, you no longer fit into your super tight fancy garments. 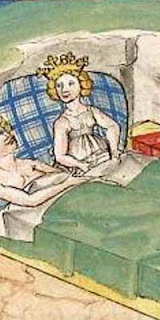 Loosing and gaining weight I suppose was something very much present in the late middle ages. 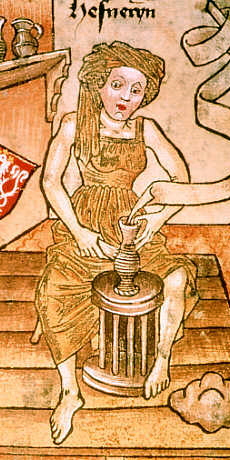 Periods of affluence were often alternated by periods of relative food shortage, in winter people living in more primitive conditions as we do now often gain weight during fall/winter to isolate themselves from the cold. And women of course also got pregnant every now and then. All of the above problems can be solved by wearing fitted underwear. 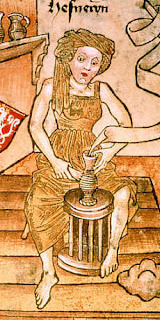 With a medieval "bra" as you gain or loose weight instead of having to make an entirely new dress or refit the old one, you can just pull the lacing of your bra tighter or give in a bit. Your upper dress will still be nicely fitted to follow the shape of your body, but it will not have to be so tight that you turn into a living pork roast! This way there will be room for breathing, for small weight fluctuations, and for putting on extra underwear on cold days. It is known that extra underwear in wool or fustian was worn in Flanders, at least by men. 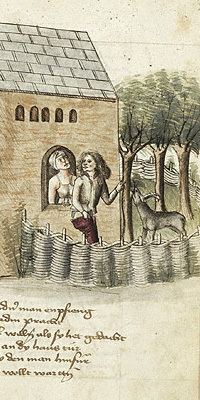 In the Bouc vanden ambochten / Livre des mestiers, Flanders, c. 1370 (Paris, Bibliothèque Nationale, néerl. 16) the author describes what a man should put on when he dresses himself in the morning. This includes a "witten roc", which is probably a simple white tunic in wool, or one could choose to wear a fustian tunic instead. "Ende s’nuchtens, als ghi wilt upstaen, eerst cleet u hemde, doet an uwe brouc, cleet uwen witten roc of u fustaen." So, although evidence is still a bit sketchy (but isn't that always the case with underwear?) I will be making a bra-shirt this week. Next weekend we are going to an event in Eindhoven, and I want to wear it there! No more breast-discomfort will be tolerated! I'll post some pictures of the progress and finished project later this week or early next week. I referred to the website of the university of Innsbrück for the first results of the analyses of the Austrian bras. The bra-corset-bra evolution is exactly what happened, or at least that's what the sources clearly indicate. I think the first bra's were a combination of a bra and a shirt, as the images in this post show. The Austrian finds indicate that from at least the early-mid fifteenth century seperate bras also existed. And then in the 16th century we find the first corsets. I have a shift with narrow shoulder straps and no sleevs. This one: http://mctekstilblog.blogspot.dk/2012/02/srk-med-stropper.html It fits very tight on the upper part, so I had to put a laced opening on the side, to be able to get it on. The shift is not that supportive, though.I guess a seam under the bust would help, I'll try that on the next one. But it probably still has to have a laced opening somewhere. I don't belive the bra can be used for our period,, as we're doing 1402, and as far as I can see, it must be 1480 or so. 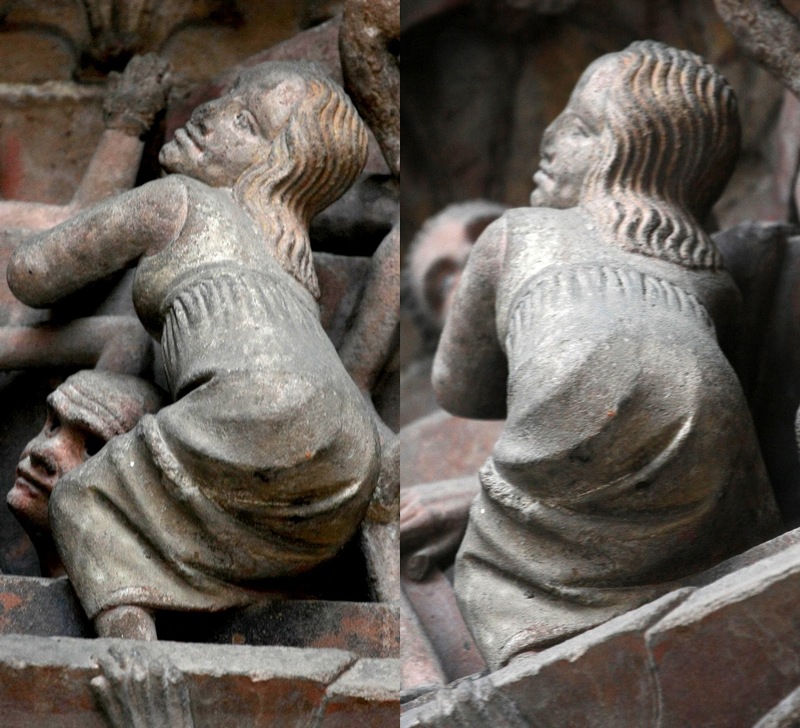 i'm not trying to say that the lengberg bras are suited for the late 14th century and c. 1400. i have not seen them dated around 1480 anywhere, I thought the C14 results pointed at late 14th century and 15th century as a date range. judging by their shape i'd intuitively date them at 1440 at the earliest. i am currently maing an interpretation of the shirt in the image from schwäbisch gmünd. i am also using a side lacing, otherwise you can not get it on and off, nor can you make it tight enough to give support. excellent write-up! Thanks for sharing. I am not exactly on the small side in the bust and though I have quite successfully managed to make a kirtle and gown (both same shape) to entirely support my bust in the fashionable high bustline of the 2nd quarter of the 15th century, the new find in Austria is very exciting. I'll be attending MEDATS so hoping to find out more as well as planning to make one myself. However, I think we do need to be careful of calling it a "bra" - to new costumers and re-enactors it can imply that a modern bra can suffice and this isn't the case. The support one will get is likely to be a different to a modern bra. From my experience with my kirtle and gown, I had better support with BOTH layers than I did with just ONE layer. It may be that the same principle will apply with this supporting undergarment and a kirtle. Which is not the same as a modern bra. The Corset as a supporting and close fitting garment has different purposes depending on the time period. It starts to appear in the form we all know and love to hate, in the VERY late 16th century (as shown by the extant ones of 1597 and 1603). Previously, its a very close fitting upper bodice which may have some form of stiffening from buckram and *maybe* boning (jury still out on that) with a skirt attached to help "pull" it down once laced up. It pushed the breasts up and squashed them to a certain extent and gently shaped the torso into what was increasingly becoming a "cone" shape. Its not till the Victorian period that we REALLY get the waist reduction that comes from the "typical" corset, once cut and construction and steel boning became the norm and could remould the body in a more drastic way. That wouldn't be possible with the early "corsets" (or bodies as they were called in the 16th century), nor would it be possible with the new "long line supporting undergarment" that has been found. I totally agree with you. I think this early fitted underwear fits perfectly in the development of the body and later the corset. Of course the word 'corset' is much older than the objects we nowadays understand by it. Which makes it all even more complex. I think it is hard choosing a proper term to use for the early supportive underwear, as so far it seems unlikely in medieval times there was a seperate word for them. The written sources mentioning them speak mostly of 'shirts with pockets for the breasts'. 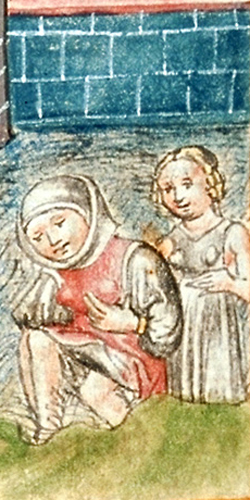 One german source of the very late 15th century speaks of 'mieder' which means bodice. In flemish written sources the word for bodice (which is 'lijveken' in middle dutch) only begins to appear at the beginning of the sixteenth century. It's a challenge finding a term for this underwear that isn't too genreric and at the same time doesn't conflict with what we know from period terminology. This is a wonderful article - Thank you for sharing! I was wondering if you've been able to find any evidence of this undergarment being used in northern Europe. Would women have used this under a fitted kirtle, for example? Lijsbet, what region exactly do you mean by Northern Europe. Just Scandinavia or everything north of the Alps? Most evidence show here is from Germany and Austria. These are all the sources I know of. Thanks for a wonderful article! (I've Pinned this for others to enjoy too.) 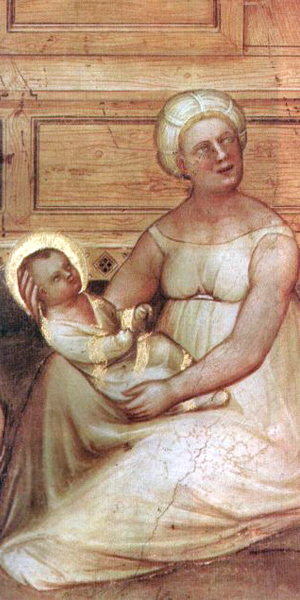 Regarding the Birth of John the Baptist piece from Padua, might the pleats in the upper part of the dress instead be seams of moveable panels to allow for breast feeding? It's easy enough to find examples of parted chemises for this purpose. I suspect this may be the case here too, just closed up for now. Thoughts? that certainly is a possibility! i hadn't thought about that. thanks for bringing it up!